This post covers several things I've heard or been asked recently about organizing data in a data lake. Notice in the above example how the date element is repeated in *both* the folder structure and the file name. Being very clear in the naming of folders and files helps a lot with usability. Also, keep in mind that related compute engines or data processing tools might have a firm expectation as to what the folder structure is (or potentially is contained in the file name). For instance, the year and month folders might translate directly to a column within the file. Or, if you’re using a tool like Azure Stream Analytics to push data to the lake, you’ll be defining in ASA what the date partitioning schema looks like in the data lake (because ASA takes care of creating the folders as data arrives). It could be either one. I tend to think this is dependent on whether you're dealing with data that's being pushed or pulled into the data lake, and if it’s transactional or snapshot data. Snapshot data: Let’s say we want to organize the data by its "as of" date. If you look back at the very first image shown above, the CustomerContacts folder is intended to show a snapshot of what that data looked like as of a point in time. Typically this would be for reference data, and is stored in full every time it’s extracted into the data lake. Recently I used Azure Cloud Shell for the first time. This is a quick post to show how I referenced the file share in Azure Storage to communicate with Cloud Shell. Cloud Shell is a lightweight way to run scripts using either Bash or PowerShell. You can run scripts in a browser using the Azure portal or shell.azure.com, with the Azure mobile app, or using the VS Code Azure Account extension. If you have seen the "Try it now" links in Azure documentation pages, that will direct you to use Cloud Shell. The rest of this post focuses on using PowerShell with Cloud Shell. When you create a Cloud Shell account, you are prompted to also create an Azure Storage account. 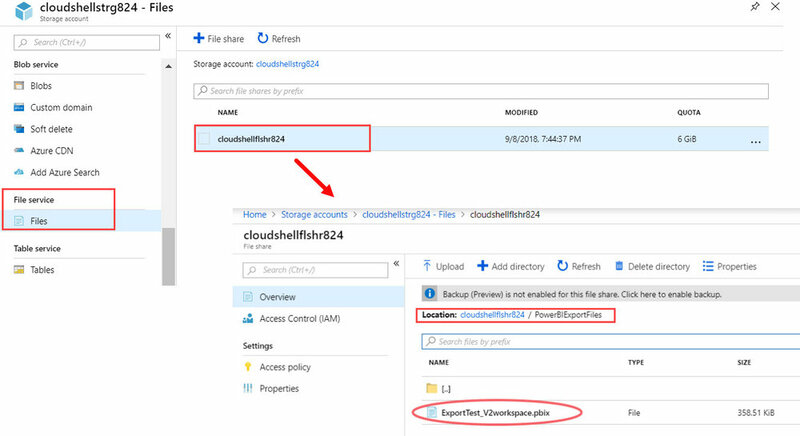 This gives you a mounted file share in the Azure Files service which is available for all of your Cloud Shell sessions. Using the mount point information we got from Get-CloudDrive shown above, we now have what we need for how to reference the Azure file share that is associated to my Cloud Shell account. For an example, I’m going to export a PBIX file from the Power BI Service (discussed in my previous blog post). Notice in the above example I used a folder called ‘PowerBIExportFiles’ — note that any folder(s) need to already exist before you can export a file to it. It won’t auto-create for you; if the folder doesn’t exist you’ll get an error that says “Could not find a part of the path.” Using a folder is optional though. A Power BI administrator is a role for managing various aspects of the Power BI Service. This role can be assigned in Office 365. Anyone with Office 365 global admin privileges is also a Power BI administrator by default. My motivation for laying this out is because initially I expected that all of the PowerShell scripts (including the Export-PowerBIReport cmdlet discussed below) would apply organization-wide. This made me think that the Power BI administrator role had become a highly elevated role which could access all content in the Power BI tenant. However, my initial expectation was wrong in that respect — it turns out that a Power BI administrator can access all metadata but not all of the actual data. Next let’s briefly review each of the 4 types of activities. The Power BI administrator role cannot be delegated to individual subsets of the organization — it applies to the entire tenant. The role also cannot be granted in a read-only way. This can make it challenging in a very large organization. For example, let's say you're a large worldwide organization with five main divisions. One of the key Power BI people from division A requests access to the Power BI Admin Portal because they want to be able to view what the settings are. An example I've seen of this is someone thinking that the 'push apps to end users' doesn't work, when really the issue is that it's disabled by default in the tenant settings. With the introduction of the Power BI Management Module, we can more easily run scripts to perform certain activities such as accessing metadata. There are several cmdlets available, for instance: Get-PowerBIDashboard, Get-PowerBIReport, and Get-PowerBIWorkspace. The key point above is that the Power BI administrator can retrieve all metadata like this, including My Workspace for other users. This is actually great because it means a Power BI administrator can put together an inventory of the content in the tenant. If you compare this to usage data from the Office 365 audit log, you could determine what isn’t being used. There are PowerShell cmdlets such as Add-PowerBIWorkspaceUser and Remove-PowerBIWorkspaceUser to manage the new type of workspaces (i.e., the V2 ‘new workspace experience’ that is in preview as of this writing in late 2018). The interesting part of the above example is that my Power BI administrator account does *not* have any direct permissions to the workspace. However, the organization scope allows it to be done. There is a PowerShell cmdlet called Export-PowerBIReport which, as the name implies, exports a PBIX from the Power BI Service. This includes the report and the underlying data. Unlike the previous two examples, Export-PowerBIReport does require the Power BI administrator to have rights to the workspace in order to access the content. This is what I was observing, so I was happy to have it confirmed by Chaz Beck (CodeCyclone) from the Power BI product team when he replied to this GitHub issue. This is a legitimate unauthorized (401) message when a Power BI administrator tries to export a PBIX that resides somewhere that the administrator doesn’t have access to - this includes My Workspace for all other users. One limitation to this: reports and dashboards created directly in the Power BI Service cannot be exported in this manner, which means this method cannot be used for migrating content across tenants. Also, this cmdlet appears to only work with the new workspace experience that is currently in public preview. I get an unauthorized (401) message, even if I’m an admin on the workspace itself, if I try this on a V1 workspace. This is confirmed as a bug on this GitHub issue. Hopefully this post saves you some time in determining how permissions apply to the different types of activities that a Power BI administrator can do. The scripts shown above are super simplified, not really ready for actual production use, but I kept them simple since the focus of this post is on permissions. Also, keep in mind that you do *not* have to be a designated Power BI administrator to use the Power BI PowerShell cmdlets — any user can run them related to their own content. However, you *do* need to be a Power BI administrator in order to set the scope to organization (for those cmdlets which support it). Most data lake technologies store data as files (like csv, json, or parquet). This means that when we extract relational data into a file stored in a data lake, we lose valuable metadata from the database such as data types, constraints, foreign keys, etc. I tend to say that we "de-relationalize" data when we write it to a file in the data lake. If we're going to turn right around and load that data to a relational database destination, is it the right call to write it out to a file in the data lake as an intermediary step? (2) Will multiple downstream teams, systems, or processes access the data? If there are multiple consumers of the data (and presumably we don't want them accessing the original source directly), then it's possible that providing data access from a data lake might be beneficial. (3) Do you have a strategy of storing *all* of the organizational data in your data lake? If you've standardized on this type of approach, and (1) or (2) above applies, then it makes sense. (4) Do you need to provide a subset of data for a specialized use case? If you can't provide access to the source database, but a full replica or another relational DB is overkill, then delivery of data via the data lake can sometimes make sense. The above list isn’t exhaustive - it always depends. My rule of thumb: Avoid writing relational data to a data lake when it doesn't have value being there. This is an opinion and not everyone agrees with this. Even if we are using our data lake as a staging area for a data warehouse, my opinion is that all relational data doesn't necessarily have to make a pit stop in the data lake except when it's justified to do so. James Serra’s blog - Should I load Structured Data Into My Data Lake?